Suzi and I are in Utah, somewhere on a trail. Our backpack has some noshes for eating along the way. And that will include pickles. From my 2014, here’s a great, great book for pickling up. Or down. Pear Honey. Don’t cheat now and look at the recipe at the bottom. Just pause and imagine what it might be. I’ll tell you now, it does not contain honey. 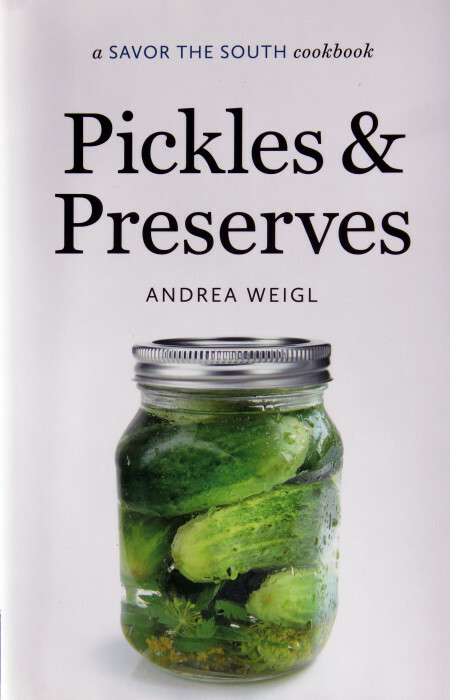 Pickles & Preserves by Andrea Weigl is one of this year’s releases in the Savor the South Cookbook series from the University of North Carolina Press [check out Amazon for more information on the brilliant books in this series]. Born up North, but now a Southern lady in every sense of the word, Andrea embraces preserving food year round [although, being in the South she does have a winter advantage since the snow banks are often small]. She teams up with friends for communal canning days where the products go far beyond simple strawberry jam. A Philadelphia tinsmith named Mason invented the Mason jar in 1858 [I don’t know if he is related to the Mason of the Mason-Dixon Line]. But certainly after the Civil War, the impoverished South embraced home canning with those glass jars. Home canning peaked in the United States in the 1930’s and 1940’s. The Federal government helped established over 3,600 community canning centers across the nation where families could go to process home-grown harvests. I went to one, and helped my mother can, in the 1950’s in Portland. I can still see rows and rows of gray metal cans on our shelves, filled with gray beans and grayer peas. How did they taste? Oh, how I wish we’d had this book. Different regions of our country have different climates, ethnic mixes, and histories. The South was first settled by Western Europeans who flourished in a fertile land. Post the Civil War, there was economic hardship for the lower classes, of all races, that extended for decades. The people there can surely be described as “down but not out.” Human inventiveness can never be overestimated. You have to be hungry to think you can make something edible out of watermelon rind, but they discovered how in the South with that pickled rind. Today, we walk into mega-markets with thousands of feet of shelf space and a seemingly endless variety of foods. But, the truth is, most of those foods come from a handful of centralized manufacturers [yes, I think that food is manufactured, not made]. The average jar on the average shelf has been trucked perhaps a 1000 miles. It ain’t local. And the “endless variety” on those shelves is an illusion. There may be a half dozen kinds of strawberry jam on the shelf, but you’d have to search hard to find the strawberry chile jam of a New Mexico by way. And that Pear Honey stuff? Not in my market. You can say it is just Darwin and evolution: the survival of some foods while others disappear. And, it’s true that most of the animal species that ever lived have died out. Only the “fittest” and “latest” are here. But we are humans controlling our destiny and our lives. Our culinary heritage does not have to fade away. If the store shelf does not have Pear Honey, it does have pears and it does have pineapple. And if you have Pickles & Preserves you can keep that wonderful treat, and many others, alive and well. I was seduced by the name of this recipe, which kept turning up in old southern cookbooks. Who wouldn’t want to eat something called pear honey? Think of it as pear butter and enjoy it slathered on savory cheddar cheese scones. Wash five pint jars, lids, bands and tools in hot soapy water and dry with a clean kitchen towel. Place the jars inside the water-bath canner and fill canner with enough water to cover the jars by 1 inch. Place canning pot on the stove. Make the pear honey: if you like smooth preserves, blitz the pears, lemon juice, and pineapple in a food processor and then place the puree in a large stainless-steel stockpot or enamel Dutch oven. Otherwise, use a potato masher to smash the pear slices and pineapple chunks with the lemon juice in the pot. Add the sugar to the fruit. Stir to combine. Cook on medium-low heat for 1-1 1/2 hours. Adjust the heat if necessary and stir occasionally to prevent burning. Thirty minutes into cooking the pear honey, turn the heat on high under the water-bath canner. Turn the heat on medium low under the small saucepan with the lids. Adjust heat if necessary under the small saucepan to maintain a simmer. When the pear honey is as thick as you like and the water in the canner is boiling, get ready to can. Remove the jars from the canner, pouring out any water. Place the jars on a towel-lined countertop. Ladle the pear honey into the jars, leaving 1/4 inch of headspace. Use a thin spatula to stir the contents of the jar to release any air bubbles. Wipe the rim of each jar with a clean damp towel. Place a lid on each jar and then twist on a screw band until tight. Place the jars back in the canner and process for 10 minutes. When done, remove jars from the canner and place on a towel-lined countertop several inches apart. Let cool to room temperature. You should soon hear the “pop” of the lids, signaling a job well done. Pear Honey can be enjoyed immediately.